Reprint. Originally published: London: Jonathan Cape, 1978. The Enormous Crocodile is planning what to have for his lunch. This foul fiend - the greediest croc in the whole river - wants to eat something juicy and delicious. His teeth sparkle like knives in the sun and he's getting hungrier and hungrier. But what can the greedy grumptious brute guzzle up?Beware - he's looking for someone . 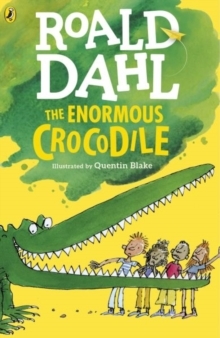 . . someone who looks a lot like YOU!Listen to THE ENORMOUS CROCODILE and other Roald Dahl audiobooks read by some very famous voices, including Kate Winslet, David Walliams and Steven Fry - plus there are added squelchy soundeffects from Pinewood Studios!